Tony Romo a Football Analyst? ESPN- The Tony Romo Watch used to be about the Denver Broncos or Houston Texans. It is also about Fox and CBS. A source told ESPN's Adam Schefter that CBS is making a strong push to add the Dallas Cowboys quarterback to its team. A source told Schefter earlier this month that Fox was interested in Romo replacing John Lynch as an analyst. Oh please no, I don't need Tony Romo on my TV EVERY Sunday telling me his thoughts and feelings. I especially don't need a Jerry Jones sympathizer, Fox already has one of those in Jimmy (Extenze) Johnson. If given the option I guess he could go to CBS, because I don't watch their pre or post game shows anyway. I also just don't think Romo would be that good of an analyst. He's going to get asked about how players comeback from injuries and all that stuff he knows, because he's played a total of 3 snaps (collarbone, back, and collarbone again) the past two years. That is just going to be depressing and a reminder for him ever single time that he should of had his milk. Then his bones wouldn't be so brittle. If I'm him there is also no way I want to jump right into an area that I have no experience in, plus he's got to young kids. Enjoy the time with them. You basically stole millions of dollars from Jerry Jones and that's really the best thing you could have ever done in your career. 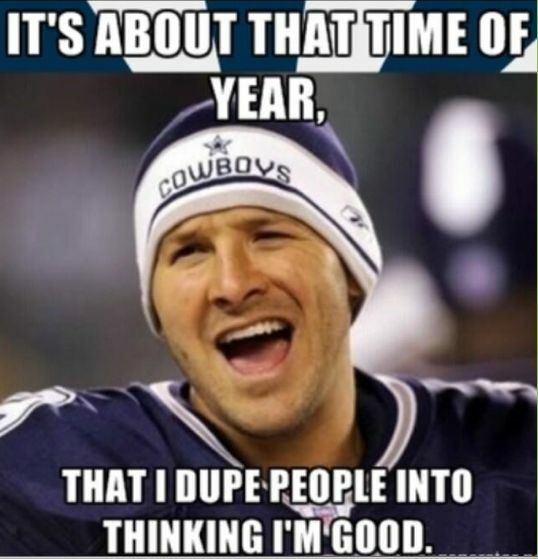 The only thing that was better than that was making so many timely mistakes that prevented you and the Cowboys from ever having any post season success, so from an Eagles fan, thanks Tony.